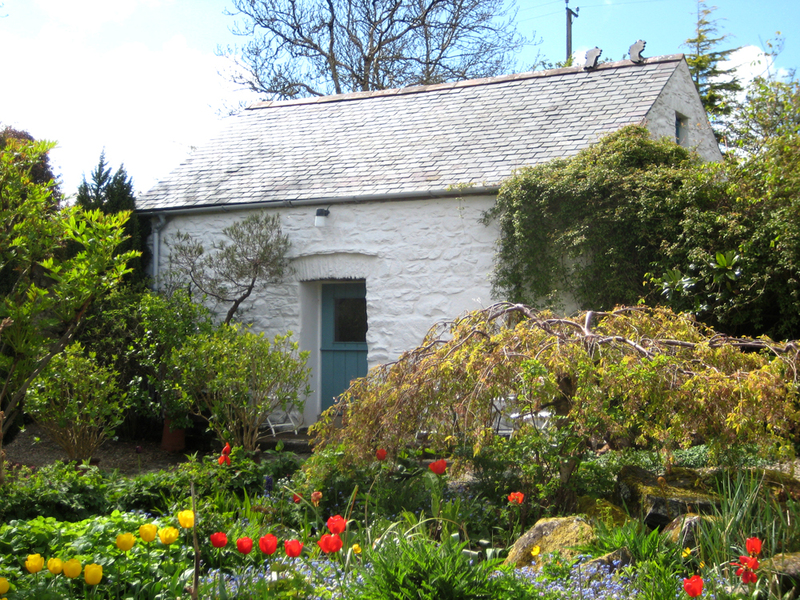 Y Bwthyn Bach, a one room holiday cottage situated in the garden but secluded and private… Sleeps 3 adults and an optional 4th. Their is a counterweighted staircase accessing an open sleeping loft with low beds under the eaves. Kitchen and shower room and a comfortable eating/sitting area with wood burning stove. No television, radio and CD player can be supplied. Poor mobile signal (Our house phone is available to make or receive essential calls) WIFI provided. Y Bwthyn Bach is set under the Preseli hills, hidden in a stunning 6 acre garden in the Pembrokeshire Coast National Park, beyond the garden it faces the hillside and moorland of Garn Fawr. This romantic barn conversion is the perfect place to find peace and privacy. Comfortable sofas and a wood burning stove make the cottage a cosy bolthole that is hard to leave but when you do the sea and the coastal path are just one mile away. 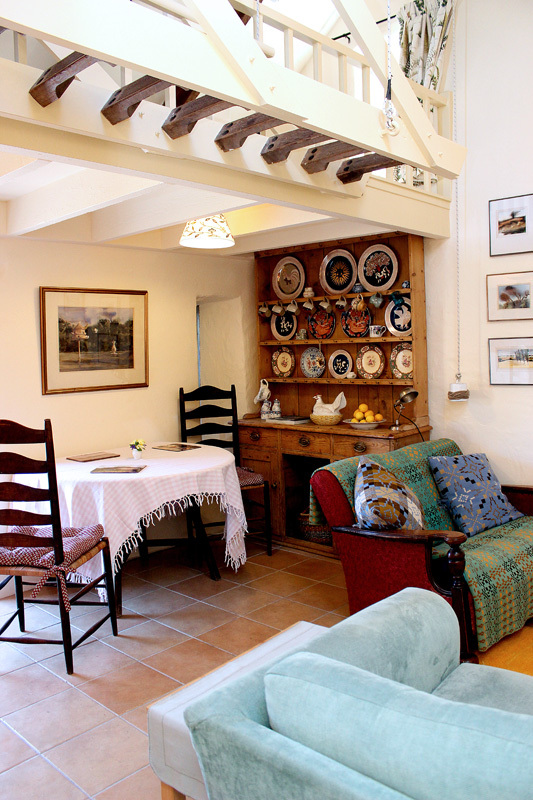 The cottage is filled with books and paintings and the owner’s extensive library in the garden is also available to you. Numerous tiny windows frame glimpses of the garden in which it is set. Secluded, private and quiet, ideal as a retreat or work place as well as for relaxing holidays. The six acre garden is all yours in the evenings and early mornings. The cottage is stone built with a slate roof. Situated at the end of a 300 metre drive off a quiet lane it is 3 miles from Fishguard and only one mile from the nearest beach, and the coast path. Downstairs there is a modern kitchen and a shower room. Dining table, Welsh dresser and sofas around the wood burning stove. There is access to a freezer, washing machine and tumble drier. WiFi connection is installed but there is no television. Radio (LW only), and a CD player available. 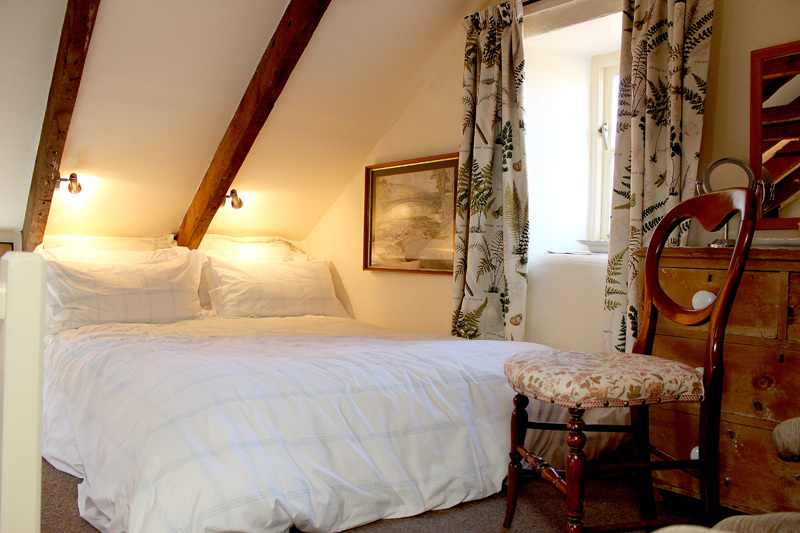 Optional bed linen and towels are £30 for the king size bed and £20 per single bed. Or bring your own of course. Duvets, pillows and other household linen supplied, see below. Please bring your own beach towels. Some ‘Welcome’ refreshments will be waiting for you, and if the stove is not lit when you arrive then it is laid ready to light. Arrival from 2pm (1400). Departure by 10am. Electricity and unlimited logs for the wood burner are included all year round. Well-behaved dogs are welcome, however there is a charge of £10 per dog per week/short break and a maximum of 2 dogs. Please let us know the number and breed of dogs accompanying you. \"I have just finished reading the account of your very special garden in Stephen Anderton\'s book and I write to offer you my congratulations on all the effort, time and love you have given this creation. From the photographs alone it looks to be a garden of the heart and I note how close the wild moor is, looking down on this little pocket of paradise\"
- ROY LANCASTER O.B.E. V.M.H. F.I.Hort. By subscribing you consent to us holding your data (name and email only), securely. We never share your information with anyone else and use it solely for the purposes of our newsletter.